It was once common for vegetarians to fret over whether they were getting enough protein. Myths abounded about the necessities of combining certain foods in order to obtain complete protein. In reality, protein deficiencies are uncommon in vegetarians who eat eggs and dairy products, according to the Harvard Women's Health Watch. Vegans, who eat no animal-based foods, can get enough protein by eating nuts, grains and seeds, which offer incomplete proteins that nevertheless meet your body's needs when consumed responsibly. Plant-based sources of complete protein are rare, but quinoa and amaranth are two grains that are exceptions to the rule. There are 20 different amino acids in a complete protein. Your body is capable of synthesizing 10 of these. You must consume the other 10 through dietary sources. Those are referred to as "essential" amino acids. A deficiency in any one of those 10 essential amino acids can cause the proteins in your muscle and other tissues to deteriorate, as your body seeks to obtain the necessary amino acid by stealing it from your own body tissue. Quinoa and amaranth each contain 18 amino acids. They both lack asparagine and glutamic acid, but your body can create those nonessential amino acids on its own, so quinoa and amaranth are regarded as complete proteins. The rich amino acid content of these two grains makes them a great choice for vegans seeking a reliable protein source. Women older than 18 are advised to consume a recommended dietary allowance of 46 g of protein per day. Men should consume at 56 g of protein daily. A cup of cooked quinoa contains about 8 g of protein. 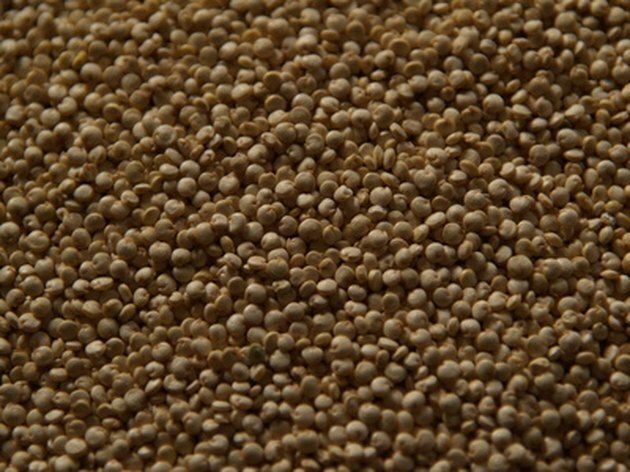 A cup of cooked amaranth supplies 9.35 g of protein. Quinoa is a light nutty grain that is easy to prepare and versatile as an ingredient. You can purchase quinoa in bulk in most natural foods groceries. To prepare quinoa bring one part quinoa and two parts water to a boil with a pinch of salt. Let the quinoa simmer until the grains pop open and become translucent. Cooked quinoa can be eaten plain, dressed up with some chopped scallions, or mixed into a salad. Amaranth grains have a robust, earthy flavor that works well with flavorful spices. Amaranth tends to be sticky, and it makes a good thickener for soups. Amaranth can also be cooked as porridge, or mixed with corn meal to make polenta. Your natural foods grocery may stock amaranth cereals that can be eaten for a quick, protein rich breakfast. Is Quinoa High in Protein?